What is a Stiff ODE? This page contains two examples of solving stiff ordinary differential equations using ode15s. MATLAB® has four solvers designed for stiff ODEs. For most stiff problems, ode15s performs best. However, ode23s, ode23t, and ode23tb can be more efficient if the problem permits a crude error tolerance. For some ODE problems, the step size taken by the solver is forced down to an unreasonably small level in comparison to the interval of integration, even in a region where the solution curve is smooth. These step sizes can be so small that traversing a short time interval might require millions of evaluations. This can lead to the solver failing the integration, but even if it succeeds it will take a very long time to do so. Equations that cause this behavior in ODE solvers are said to be stiff. The problem that stiff ODEs pose is that explicit solvers (such as ode45) are untenably slow in achieving a solution. This is why ode45 is classified as a nonstiff solver along with ode23 and ode113. Solvers that are designed for stiff ODEs, known as stiff solvers, typically do more work per step. The pay-off is that they are able to take much larger steps, and have improved numerical stability compared to the nonstiff solvers. For stiff problems, specifying the Jacobian matrix using odeset is particularly important. Stiff solvers use the Jacobian matrix to estimate the local behavior of the ODE as the integration proceeds, so supplying the Jacobian matrix (or, for large sparse systems, its sparsity pattern) is critical for efficiency and reliability. Use the Jacobian, JPattern, or Vectorized options of odeset to specify information about the Jacobian. If you do not supply the Jacobian then the solver estimates it numerically using finite differences. See odeset for a complete listing of other solver options. where is a scalar parameter. When , the resulting system of ODEs is nonstiff and easily solved using ode45. However, if you increase to 1000, then the solution changes dramatically and exhibits oscillation on a much longer time scale. Approximating the solution of the initial value problem becomes more difficult. Because this particular problem is stiff, a solver intended for nonstiff problems, such as ode45, is too inefficient to be practical. Use a stiff solver such as ode15s for this problem instead. 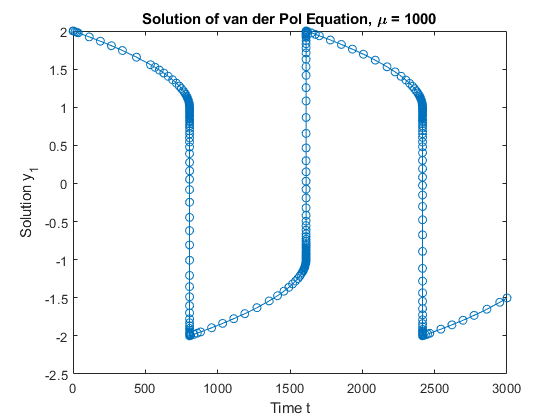 The vdp1000 function evaluates the van der Pol equation using . Use the ode15s function to solve the problem with an initial conditions vector of [2; 0], over a time interval of [0 3000]. For scaling reasons, plot only the first component of the solution. The vdpode function also solves the same problem, but it accepts a user-specified value for . The equations become increasingly stiff as increases. 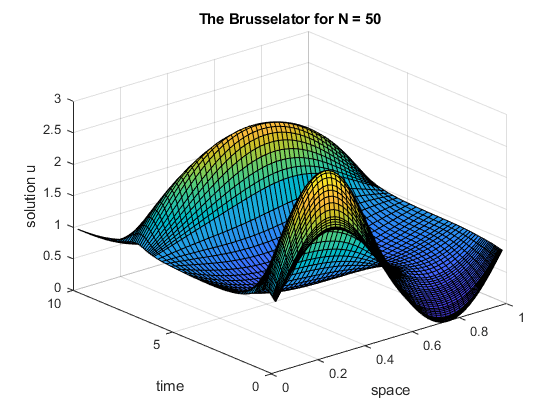 The classic Brusselator system of equations is potentially large, stiff, and sparse. The Brusselator system models diffusion in a chemical reaction, and is represented by a system of equations involving , , , and . where for . Therefore, there are equations in the system, but the Jacobian is a banded matrix with a constant width of 5 if the equations are ordered as . As increases, the problem becomes increasingly stiff, and the Jacobian becomes increasingly sparse. The function call brussode(N), for , specifies a value for N in the system of equations, corresponding to the number of grid points. By default, brussode uses . The nested function f(t,y) encodes the system of equations for the Brusselator problem, returning a vector. The local function jpattern(N) returns a sparse matrix of 1s and 0s showing the locations of nonzeros in the Jacobian. This matrix is assigned to the JPattern field of the options structure. The ODE solver uses this sparsity pattern to generate the Jacobian numerically as a sparse matrix. Supplying this sparsity pattern in the problem significantly reduces the number of function evaluations required to generate the 2N-by-2N Jacobian, from 2N evaluations to just 4. %BRUSSODE  Stiff problem modelling a chemical reaction (the Brusselator). %   (banded with bandwidth 5). %   the function are needed to compute the 2N x 2N Jacobian matrix. %   See also ODE15S, ODE23S, ODE23T, ODE23TB, ODESET, FUNCTION_HANDLE. % Problem parameter, shared with the nested function. % Nested function -- N is provided by the outer function. % Evaluate the 2 components of the function at all interior grid points. Solve the Brusselator system for by running the function brussode. Solve the system for by specifying an input to brussode.